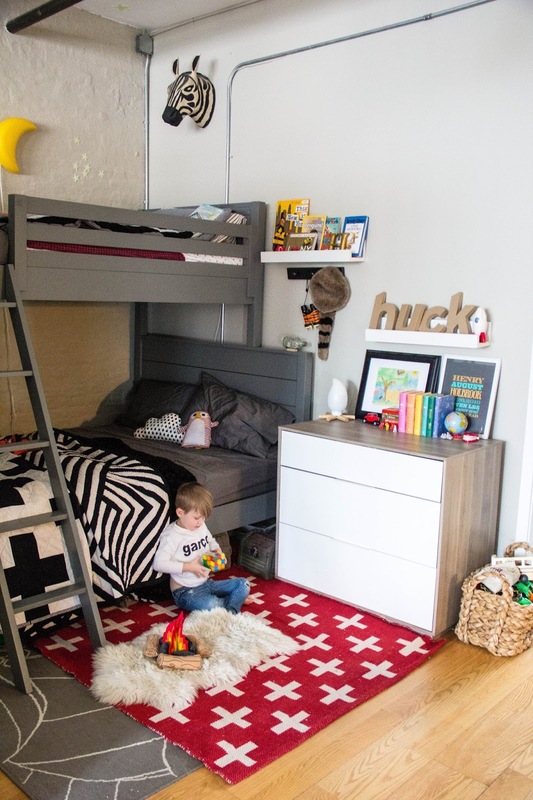 Henry Holbrook, Luckiest Kid on Planet Earth, recently got himself the upgrade of a lifetime thanks to Land of Nod, the sweetest online destination for all things kid. I swear I think Huck may have been a four-leaf clover in a past life. 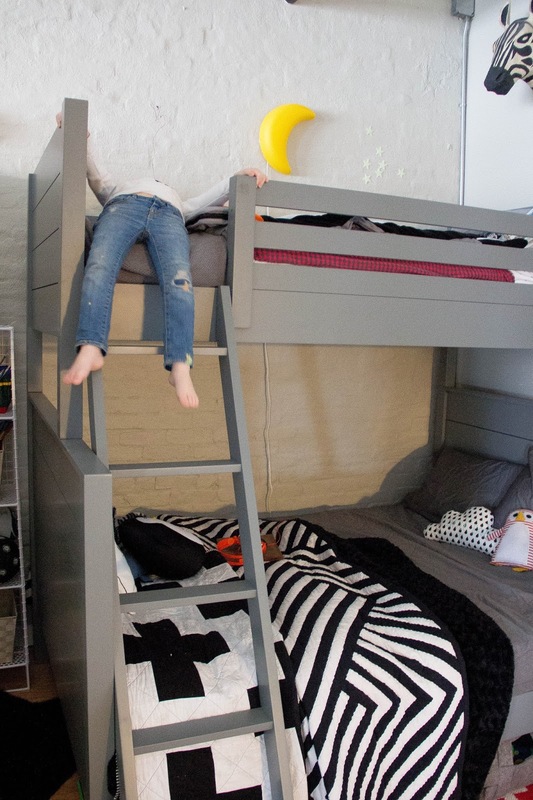 There is something really magical about a bunk bed, isn't there? ("Bump bed," if you're Huck.) 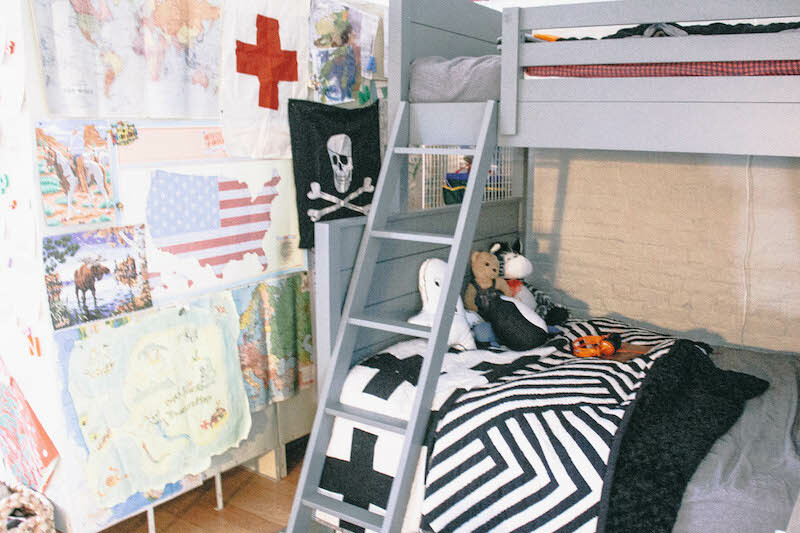 I remember desperately wanting a bunk bed when I was a kid, even though I didn't share a bedroom. And pretty much the minute Huck learned the things even existed, he was over the moon with excitement at the prospect of someday talking us into getting him one. We're talking constant negotiation, bunk beds were always on the table. "I eat my dinner and then can I have a bump bed?" "Mmmmm, how about a cookie." A few more photos of Huck's new space and plenty of source information after the jump! We chose the Uptown twin over full, thinking of potential visitors and future glee at not having to blow up an air mattress. When I was a kid I always had to give up my bedroom when grandparents came to visit--Huck will only be giving up his captain's quarters. He gets to keep the crow's nest for himself. ;) The bed was incredibly simple to put together, though it was definitely a two-person job. The thing is sturdy. STURDY being a euphemism for super heavy. I feel comfortable scrambling up to the top for nighttime bedtime stories and occasional exploratory missions to Mars. Huck's bedding is a combination of Land of Nod + Grammy-made quilts, plus Land of Nod sheets + pillowcases. We stash a lot of Huck's toys + books in those gray felt bins under the bed. These seem similar. Huck's penguin pillow was a gift from my good friend Alison from way before we knew Huck was a penguin guy (before Huck was even born I think!? ), and the rain cloud was a gift from Little Man Happy. Our downstairs neighbor benefits from three rugs to keep Huck's noise muffled--count 'em, three! We chose this indoor/outdoor rug from Land of Nod for easy cleaning + maximizing use. It's a good size for future parties in the park--really lightweight, soft underfoot. The other two are from Ikea, as is the moon lamp. Larry the zebra came from Anthropologie a good long while ago. Floating shelves + craft paper letters are also Land of Nod and can be found here and here. I think my favorite touch is the campfire nightlight. :) The campfire softies came from Etsy a hundred years ago, and Huck's coonskin cap is a Disneyland souvenir. 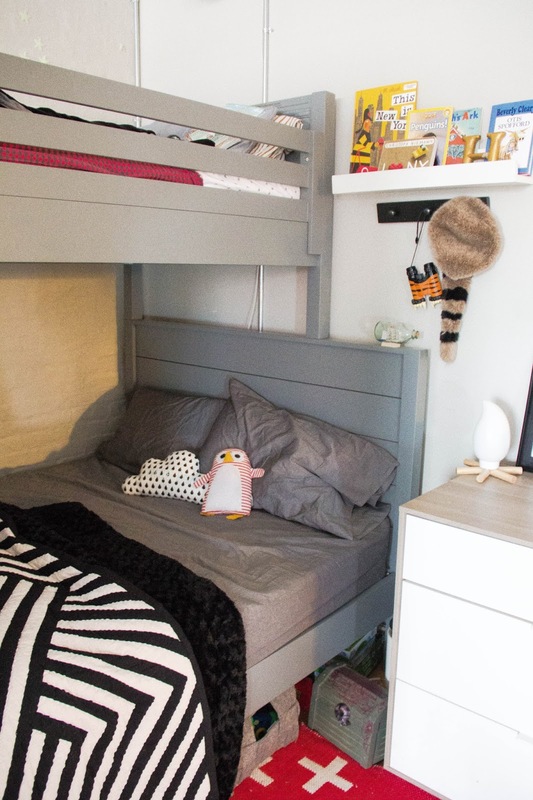 In the photo above you can see a little sliver of Huck's wire bookshelf, tucked into the space next to the bed, also from Land of Nod. It is saving our lives in the toy storage arena. The black "bear skin" rug was a gift from Rich Hippies. Cross quilt made by Rad + Happy. Full disclosure, one of Huck's three walls is actually a row of vintage lockers we found on Craigslist. This one up there. Haha (His fourth wall is missing, as is any good metafictional artist's. ;) We like to take full advantage of the magnetic opportunities here by sticking all sorts of stuff to it. Glowing parent / teacher conference reports, maps, art projects . . . paint by numbers . . . a jolly roger for luck. Paper Source sells all kinds of fun maps as wrapping paper, in the past we've gotten our maps there. Thank you many times over to Land of Nod for their generosity. Huck is so in love with his "bump bed," he's already scrawled his name all over it (in eraseable whiteboard marker--game changer!). Throughout the experience we have been so touched + impressed by Land of Nod's generosity and amazing customer service. Such a great company, we're so honored to help promote them! Yay, Huck! What an awesome bedroom upgrade! What a lucky boy ! He seems to have a beautiful bedroom ! I love the little fake fire!!! Wow he has a big boy bed!!! They grow up too fast! That looks so comfortable for the nights Molly wants me to get in with her! I think a bump bed upgrade might be due! The land of nod definitely needs a uk shop!! What a fun bed! My two year old would climb that thing all day long. So cool! 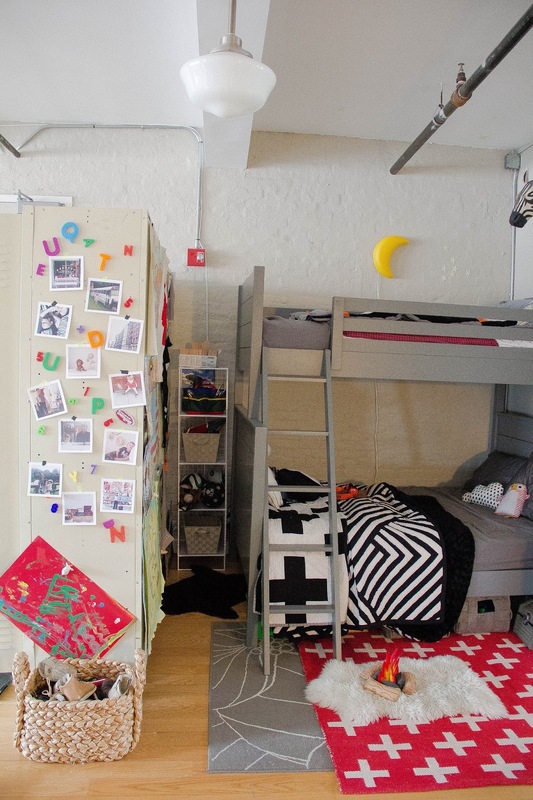 I think I would have loved a magnetic "wall" when I was growing up! You mention the three rugs muffling the noise of a kid in an apartment. I would love to hear a little about your adventures in apartments with a young child. I have a newly mobile child and have been getting complaints for my downstairs neighbor and I'm at a loss for what to do. I feel bad that they are experiencing noise, but at the same time, I don't think it is excessive and we pay to live here too! Any thoughts or advice? I have been a long-time reader, but your last instagram post has made me decide to stop for food. This is in no way meant to be bullying - I hope you have a successful, happy and healthy life. That said, because we're both intelligent adults, I personally find it tasteless and self-serving to pretend that in any way the systematic, barbaric annihilation of six million Jewish, Slavic, homosexual and disabled individuals is a black and white matter. Because you're an intelligent adult, I hope that part of what you learn about Europe is some small part of its political reality (and why many Jews feel threatened to the point of having to leave in record numbers). 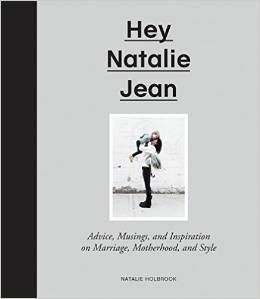 HNJ, you have a great talent for decorating and making a place to feel home. I know sometimes the subject of taste is very subjective, but I do wish I could live in that room!